The Vancouver Canadians Baseball Club is excited to offer the following positions for the 2019 baseball season out at historic Scotiabank Field at Nat Bailey Stadium! For more information about current or future employment opportunities, please contact us at the link below. We are currently searching for the right people who understand our fans first model, to join our Canadians' family. As we are a team based in Canada, only those with Canadian citizenship or valid Canadian working VISA's should apply. The Vancouver Canadians Professional Baseball Club's Sales Internship is a highly competitive program in a fast paced learning environment that offers ambitious, responsible and hard-working individuals the opportunity to gain experience in the sports industry. The Vancouver Canadians and A&B Tool Rentals Grounds Crew are looking for new members to join their team this coming summer at historic Scotiabank Field at Nat Bailey Stadium. We are seeking hardworking individuals who can keep up with the demands of grounds and stadium operations with an interest in full-time seasonal work. We are looking for individuals with experience in building maintenance, sports field and/or golf course maintenance, but will also consider individuals with experience in landscaping, horticulture and/or relative education. These positions are physically demanding, require multiple skills which include lifting materials and equipment in excess of 50lbs, a keen eye for detail, a strong work ethic, and a passion for the game of baseball. These positions also require individuals to have a flexible schedule that can go well beyond the typical '9-5'. The Vancouver Canadians Professional Baseball Club Fan Service Department is a team of fun, enthusiastic employees who are responsible for making every fan's experience at Scotiabank Field at Nat Bailey Stadium an unforgettable one. Minor League Baseball survives on a safe, clean and fun fan experience, and as a member of our game day family, it is our responsibility to deliver this for every fan that walks through our turnstyles. WhetHer you are an avid baseball fan, or don't know a batter's box from a bullpen, this is an exciting opportunity to work with a great team of individuals, build on your customer service experience and have fun in an entertaining family friendly environment all summer long. Previous Customer Service experience is an asset but not required. Assist with Ballpark Operations Dept. 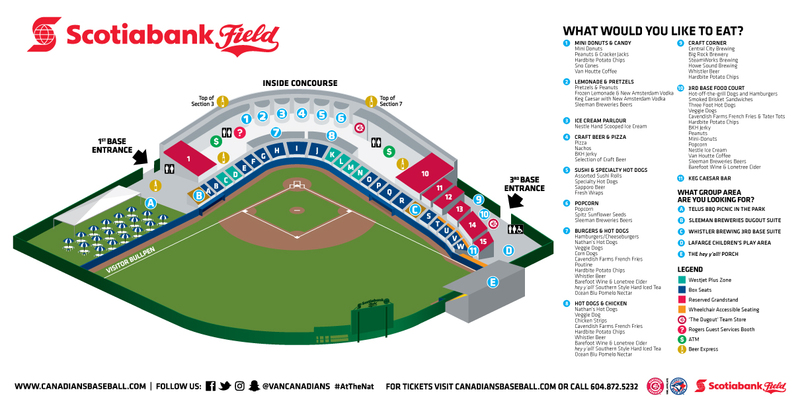 to ensure Scotiabank Field at Nat Bailey Stadium is fully operational, functional and adheres to Vancouver Canadians Baseball Club standards. Other tasks as assigned by the Vancouver Canadians Baseball Club. If you are a Non-Canadian resident, you must hold a valid work permit. Be a team player who rises to a challenge and strives for continuous service excellence. Do you have a spare bedroom and want to contribute to the success of an aspiring Toronto Blue Jays Prospect? The Vancouver Canadians Baseball Club is looking for a handful of local families who have an available bedroom and willingness to welcome a Vancouver Canadians player into their family during the season. Our Housing Family Program connects our players with families who live in Vancouver and the North Shore to stay with them during their time as a Vancouver Canadian. For many players, Vancouver is their first stop on their journey to the Big Leagues, so our housing families help provide a safe and welcoming foundation which allows them to focus on baseball during the summer. The Vancouver Canadians are looking for a handful of volunteer team drivers to help transport our players to and from their Vancouver homes to Scotiabank Field at Nat Bailey Stadium throughout the 2019 season. A standard drivers license and driving history is mandatory, but professional driving experience is not required. Our volunteer drivers are part of our Canadians family, and receive Season Tickets to cheer on the C's during the 2019 season. Responding to inter office emails as well as emails from fans.